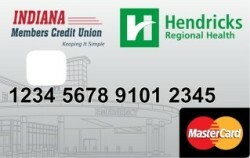 Indiana Members Credit Union features a new Hendricks Regional Health debit card! Show your pride in our independent nonprofit hospital and its community impact by requesting this new card the next time you visit a local IMCU branch. There is no cost, and it does not impact your account in any way. The great news is that for every transaction made on an HRH debit card, IMCU makes a donation to Hendricks Regional Health Foundation.